The 2015 Haunted Village Event is here!!! 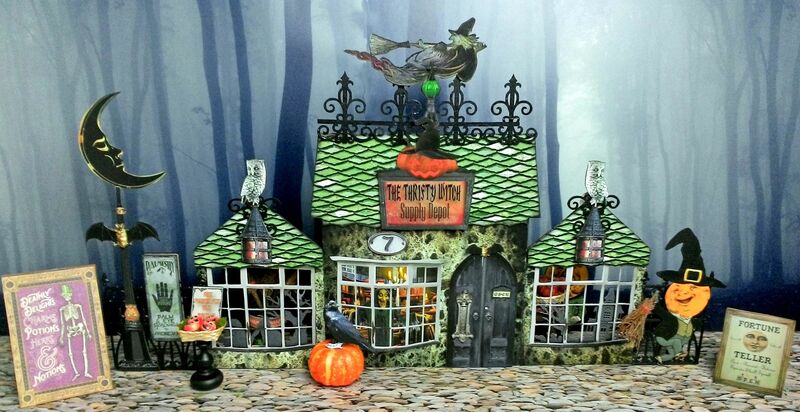 Plan to spend your day shopping at The Thrifty Witch. 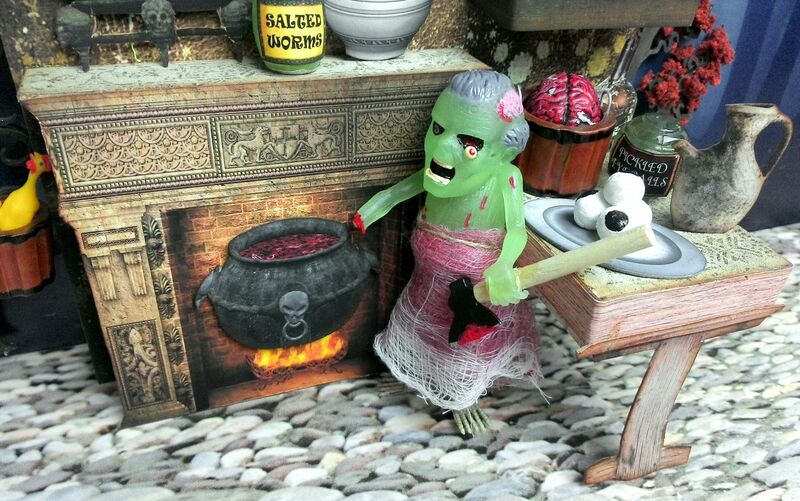 Then it is off to the Grizelda’s for a new quaff and on to the Retching Toad Eatery for dinner. Ring in midnight at the Happy Bat Tavern. 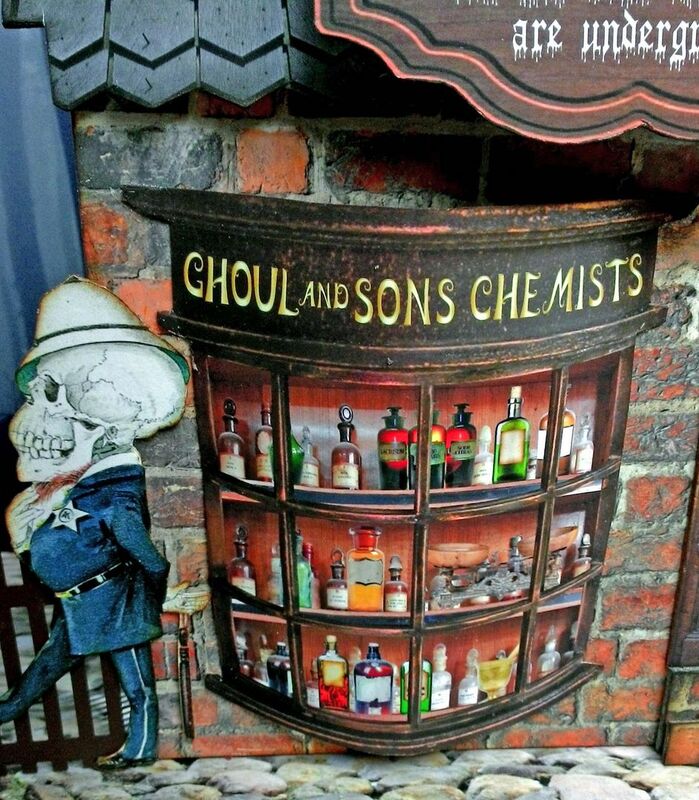 In the morning (if you survive), on your way out of town stop at Ghoul & Sons Chemist for whatever ails you. 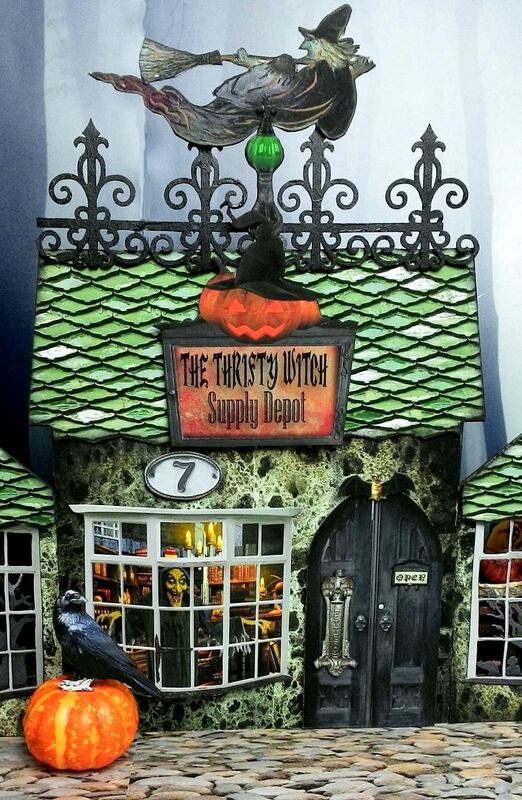 The Happy Bat tavern has been under the management of the house of Dracula for centuries. Herman, Dracula’s younger brother decided not to go into the family business but instead opened this tavern. On tap, you’ll find Blood Beer, Hair of the Dog and Black Cat Brew. If your tastes run to wine there is Dracula’s Reserve and Witch Wine which has an unusual and indescribable aroma of rotten fruit. Here are two of the regulars leaning on the bar getting an early start. Rottie the bartender is ready to serve your favorite libation. Of course, beauty is in the eye of the beholder and this house of beauty is more of a house of pain. Grizelda’s insists on payment before service just in case….just in case you don’t survive the treatment. At this salon, you’ll find state of the art electroshock therapy, the invigorating chair of nails and the nail press. Grizelda carries the ever popular Zombie line of cosmetics, which I think she secretly brews herself out of who knows what. And there’s the lovely Grizelda showing another happy customer the results of their makeover. 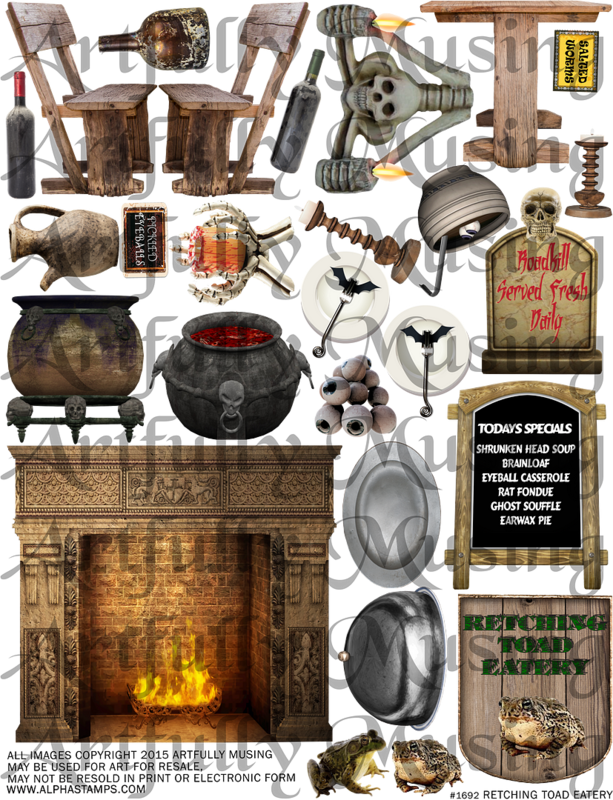 Well, the name says it all at a restaurant where roadkill is served daily and specials include; Shrunken Head Soup, Brainloaf, Eyeball Casserole, Rat Fondue, Ghost Souffle, and Earwax Pie. I’ve got a feeling that the cook’s missing hand ended up in the pot. A trusted name for 500 years and all of their best customers are underground. You can see the boys are hard at work in the lab. I see the local constable is out for a stroll. 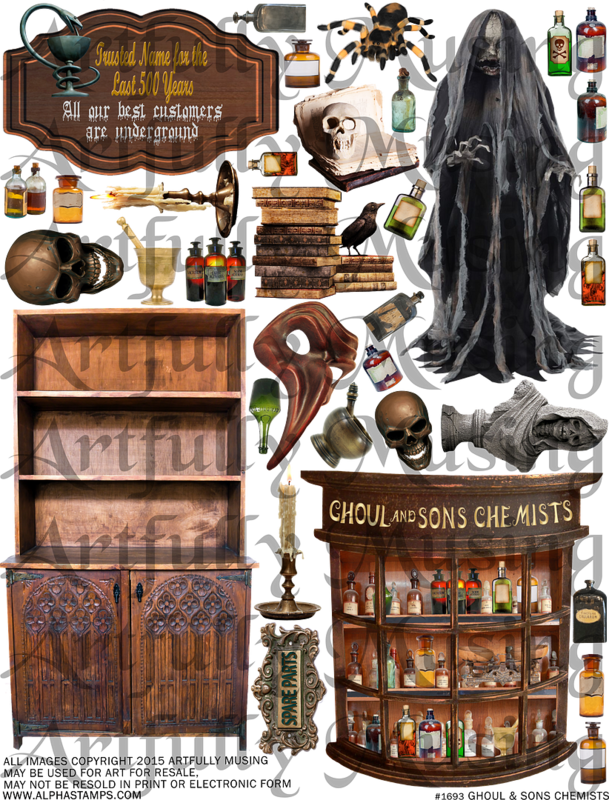 Inside Mr. Ghoul is busy creating who knows what and I think he’s got a skeleton in his cabinet, maybe a secret ingredient of one of his potions. The go-to place for all your magic needs. I see a happy moon man dancing with the broom he bought on sale. 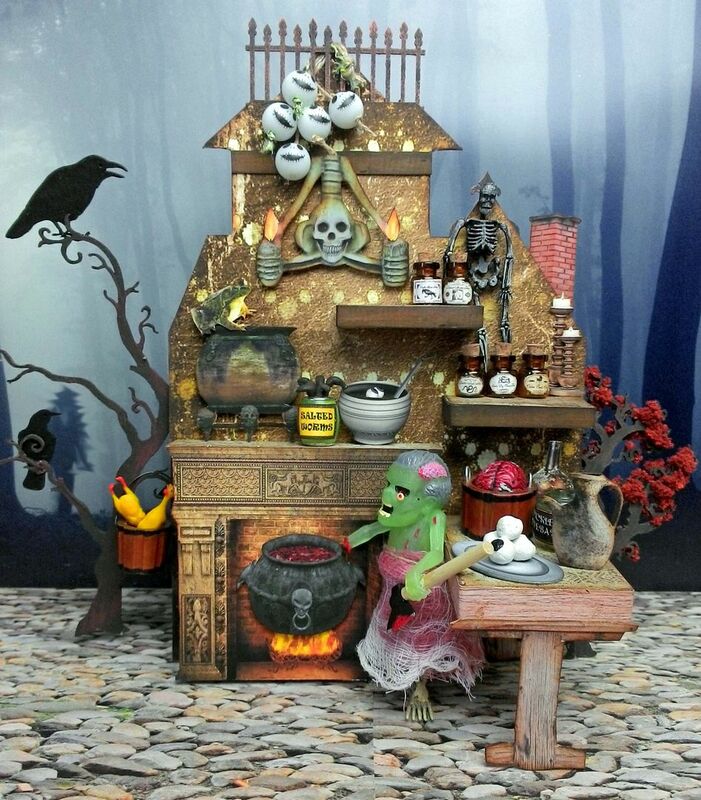 I see Belladonna the owner of the Thrifty Witch in the front window. 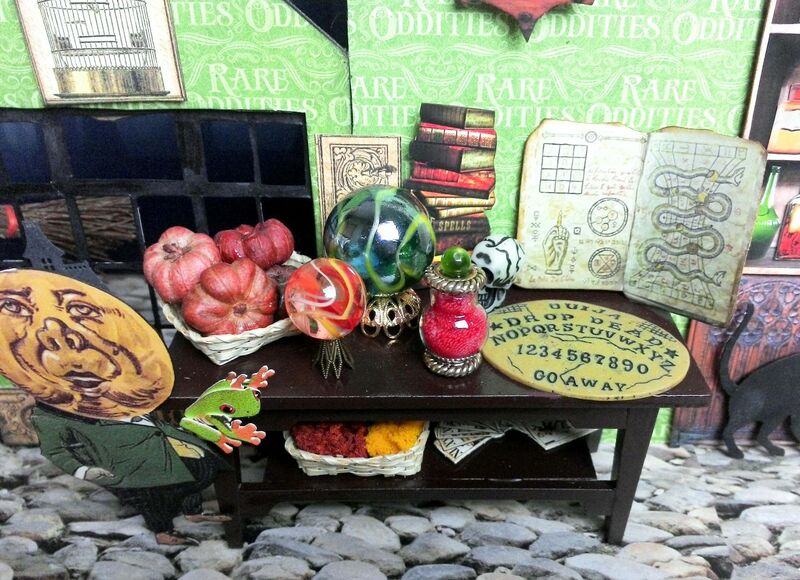 Oh, they have lovely crystal balls, pumpkins, magic books, and an Ouija board. 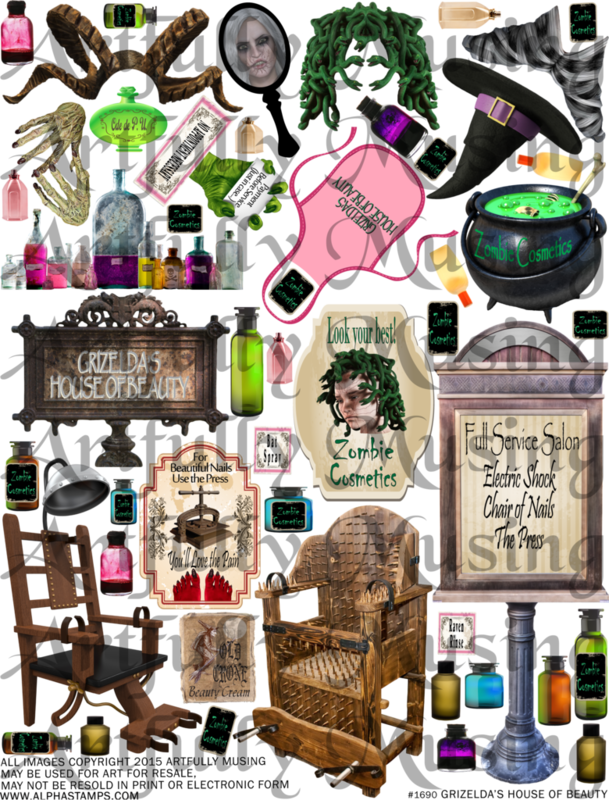 The Thrifty Witch carries all kinds of potions. 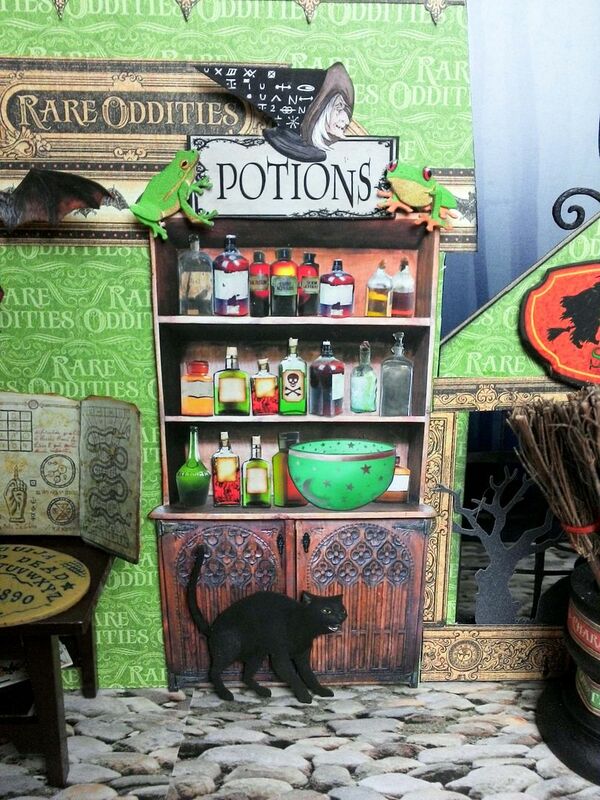 The black cat hissing in front of the cabinet is Belladonna’s pet, Sheba. It’s an interesting town, particularly for zombies, ghouls, skeletons, and ghosts. 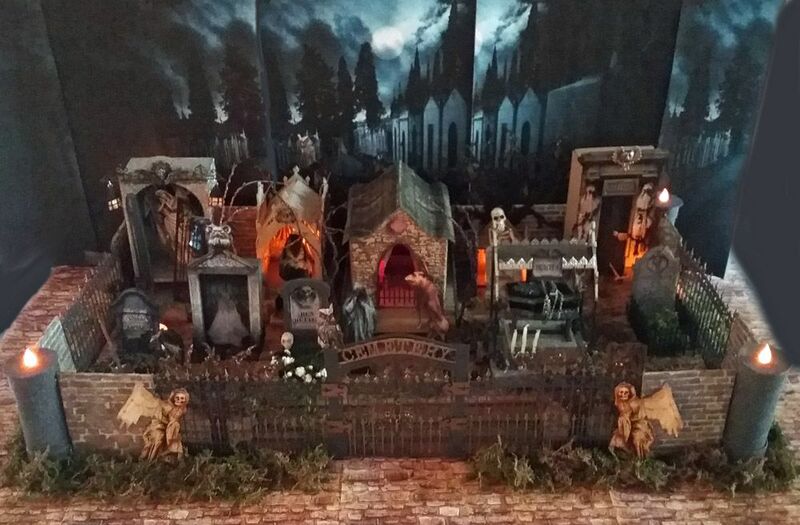 I hope you will be inspired to create your own version of a haunted town, business in the town or a haunted house to add to your Halloween display. For those who created Halloween Carnival pieces from the past event, these village pieces are a perfect complement and I will be tying in the carnival in Part 2. 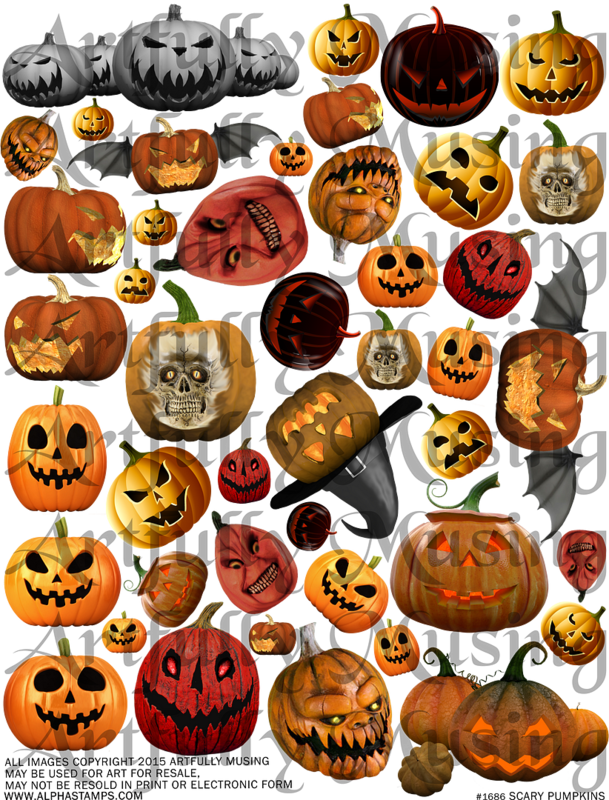 If you missed the Halloween Carnival Event and want more information click here. 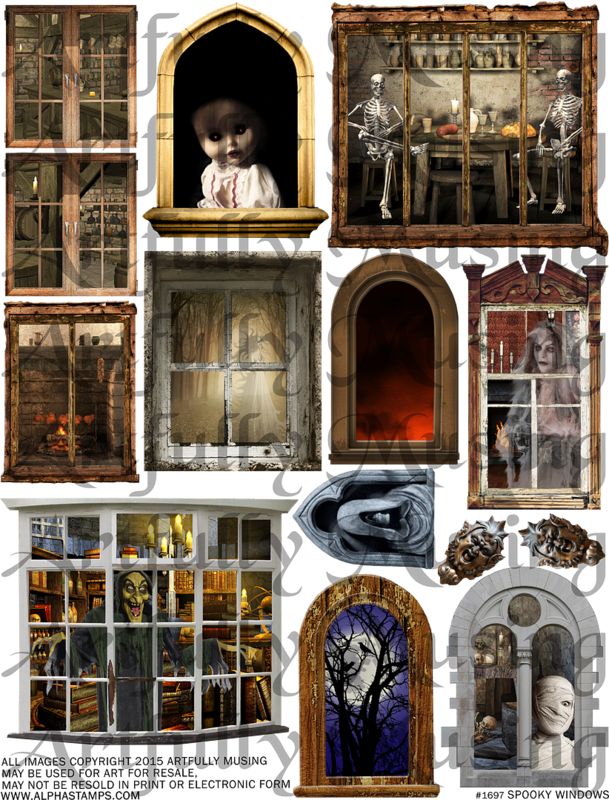 There is a collage sheet for each of the 5 village pieces covered in PART 1 plus collage sheets with architectural elements like doors and windows and a couple of collage sheets with spooky pumpkins and people. 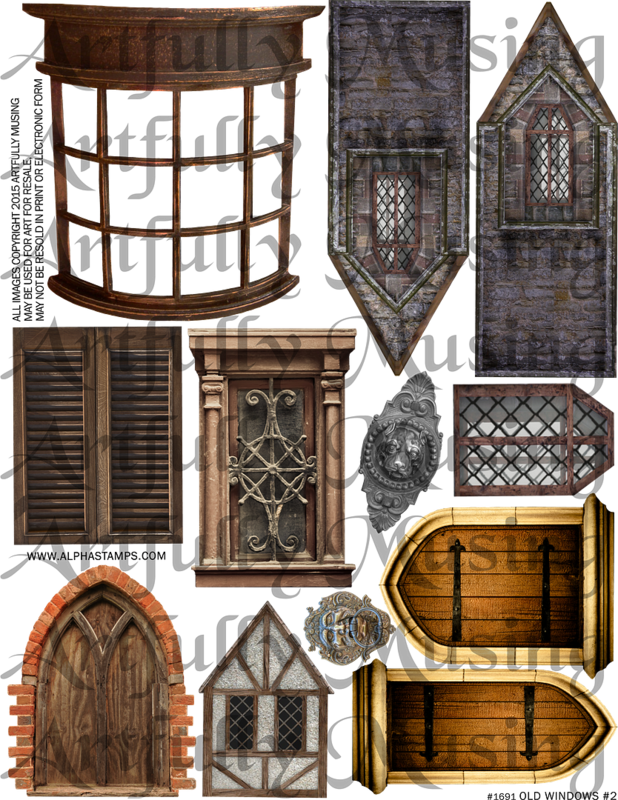 I’ll be using the architecture related collage sheets throughout the entire event (Parts 1-3) and for the remaining parts, there will be additional new collage sheets for each of the village pieces. For those who purchase PDF collage sheets, you might find this older video tutorial of mine that covers how to how to resize PDF formatted collage sheets, how to cut and paste individual images from the collage sheets (which is great for only printing the images you want and printing multiple version of the image) and how to resize images. 3 Panels that measure various sizes but are sized for the houses. 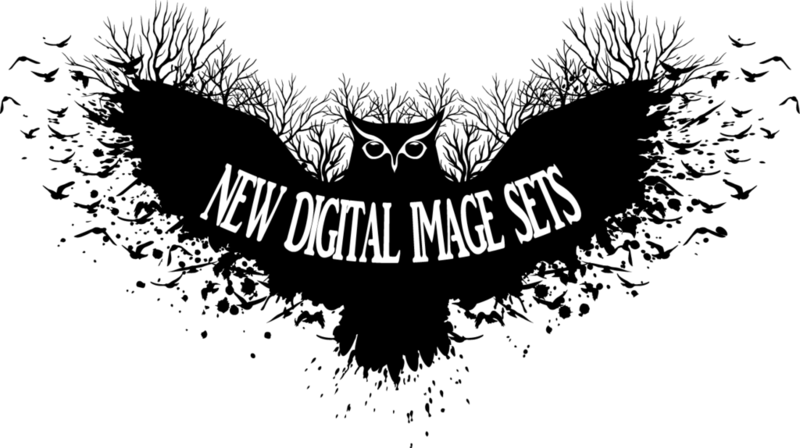 This set includes 29 images. 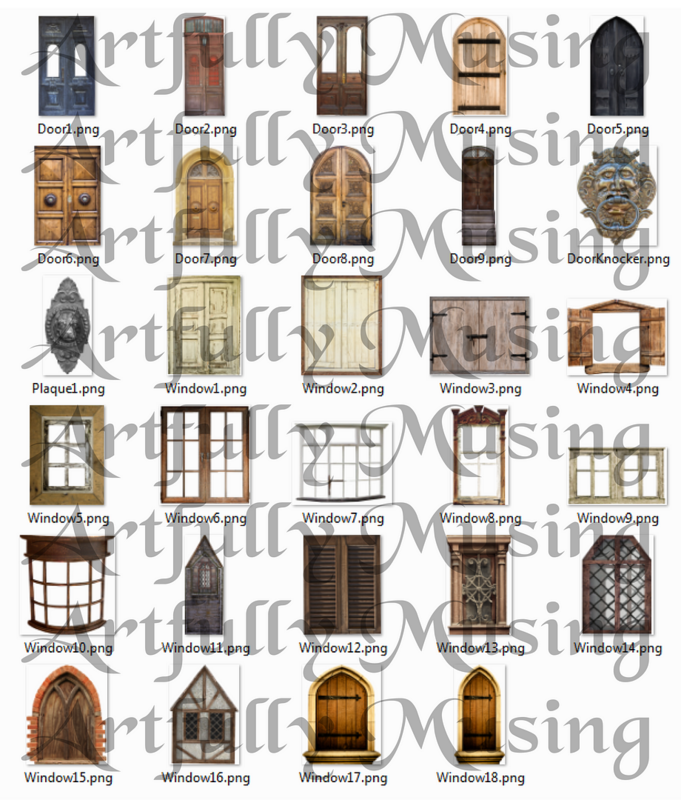 All of the images from the Old Doors, Old Windows, and More Old Windows collage sheets are included in this set. 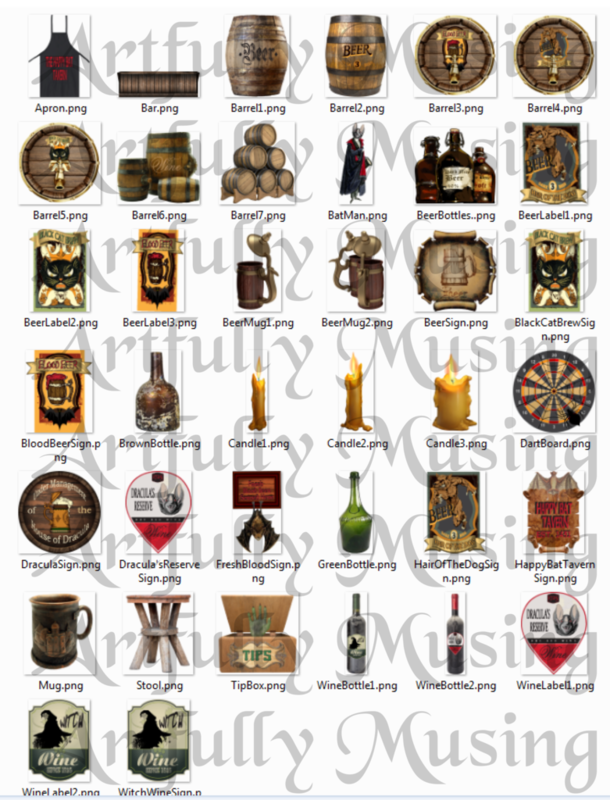 This set includes 38 Images which are the same images as on the collage sheet plus three extra images; a stack of barrels and two different beer mugs. 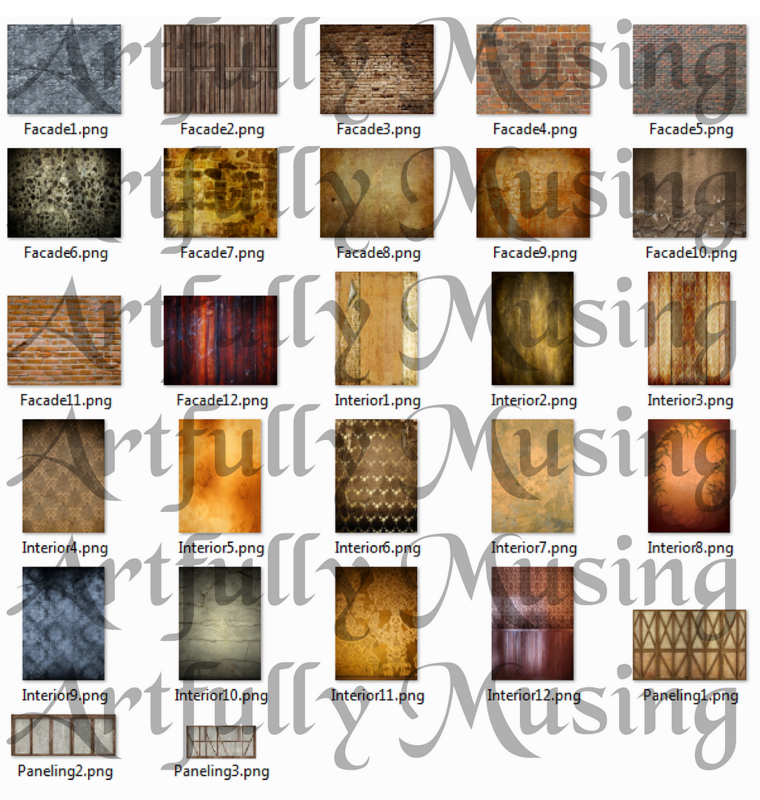 This set includes 42 Images which are the same images you will find on the collage sheet. 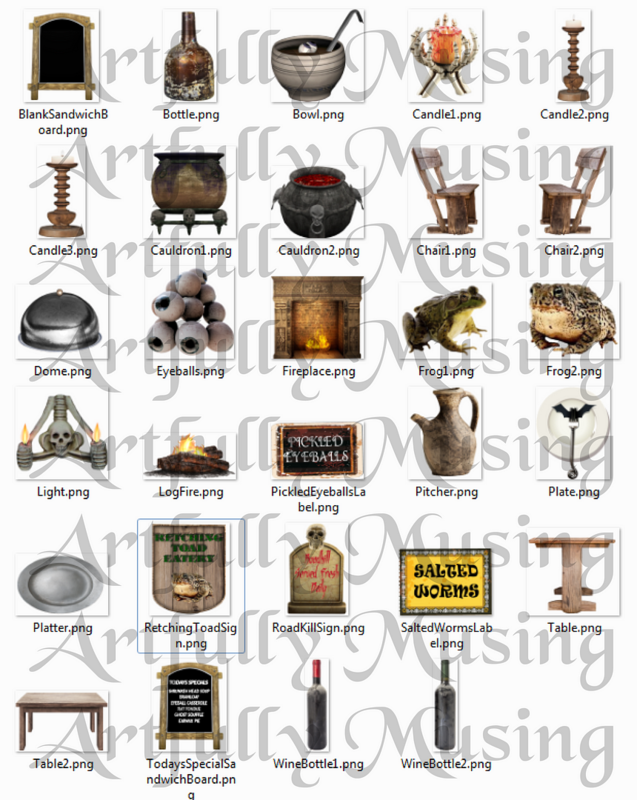 This set includes 29 images which are the same images as on the collage sheet and 3 additional images; a second table, a blank sandwich board sign, and a log fire. 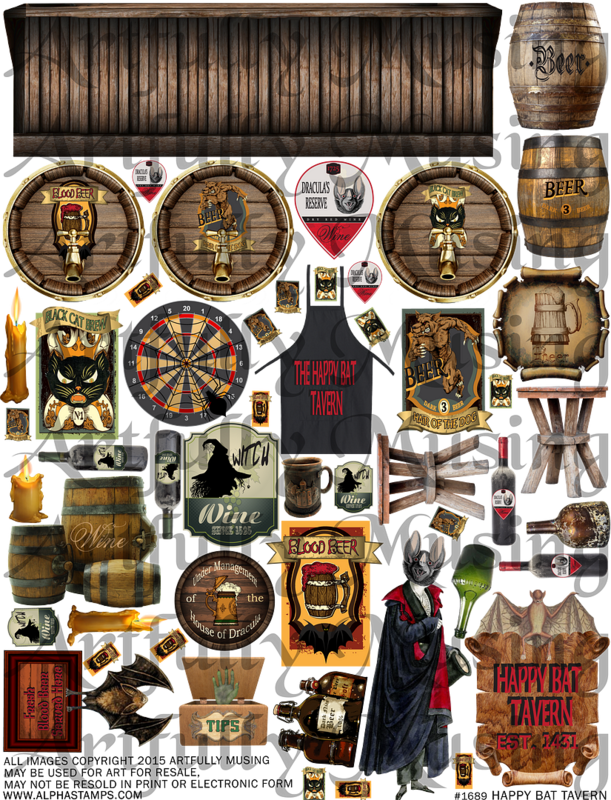 This set includes 36 images which are the same images as on the collage sheet and 2 additional images, a clock and the "We Carry" sign. 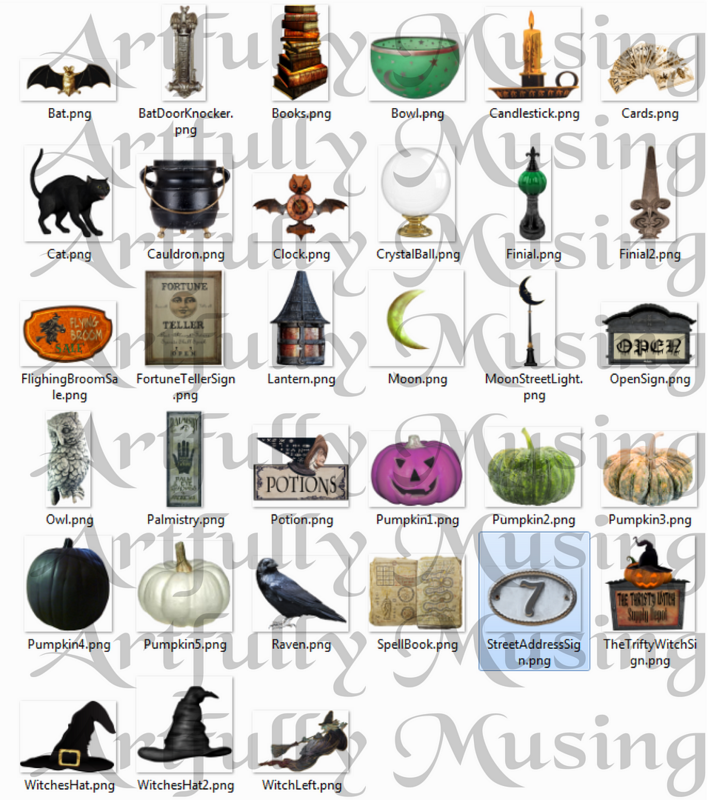 This set includes 33 images which are the same images as on the collage sheet and 9 additional images; 5 pumpkins, 2 finials, a witch and an "Open" sign. 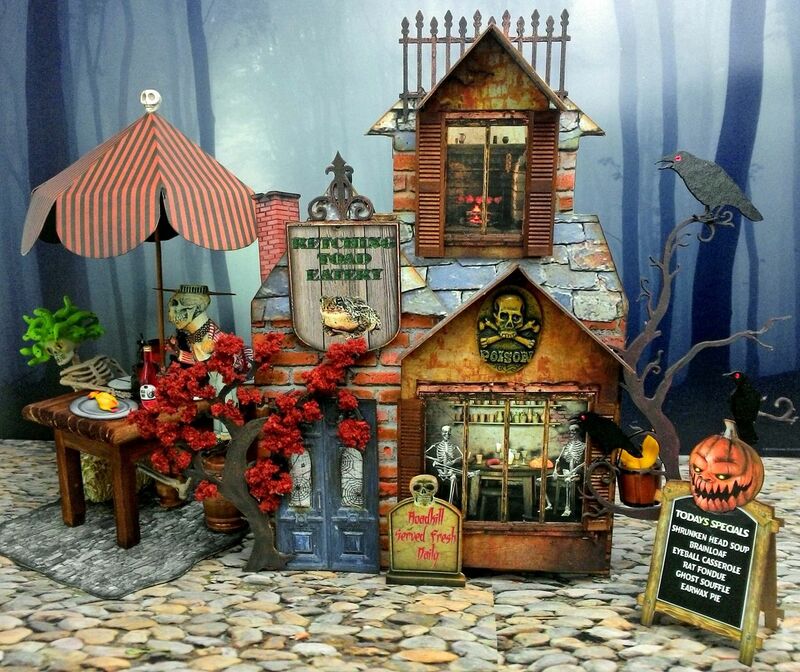 Alpha Stamps has created some kits for the Halloween Village. 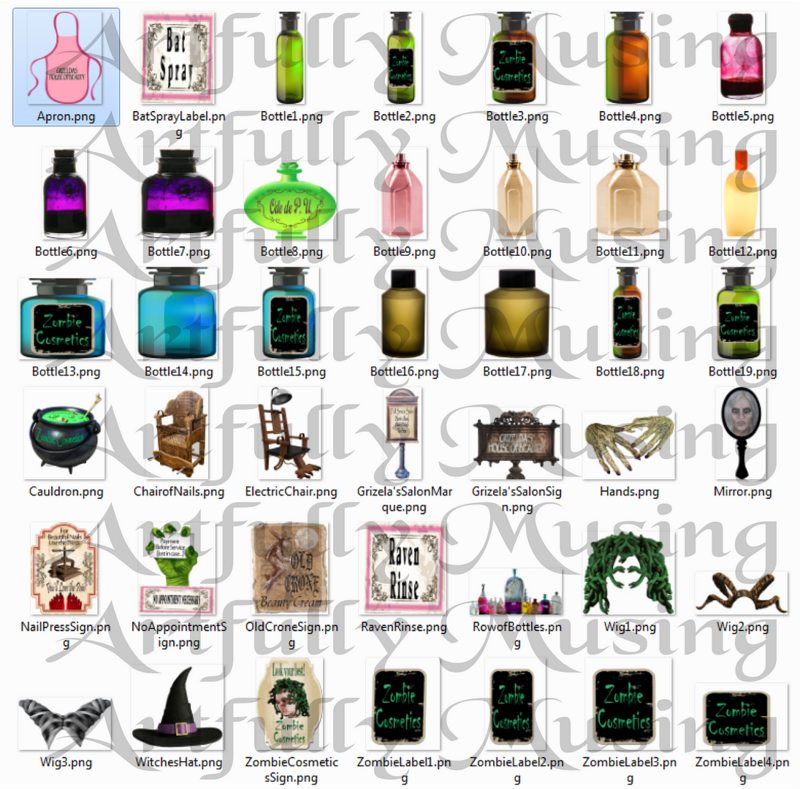 Of course, all of the products in the kits are available individually. 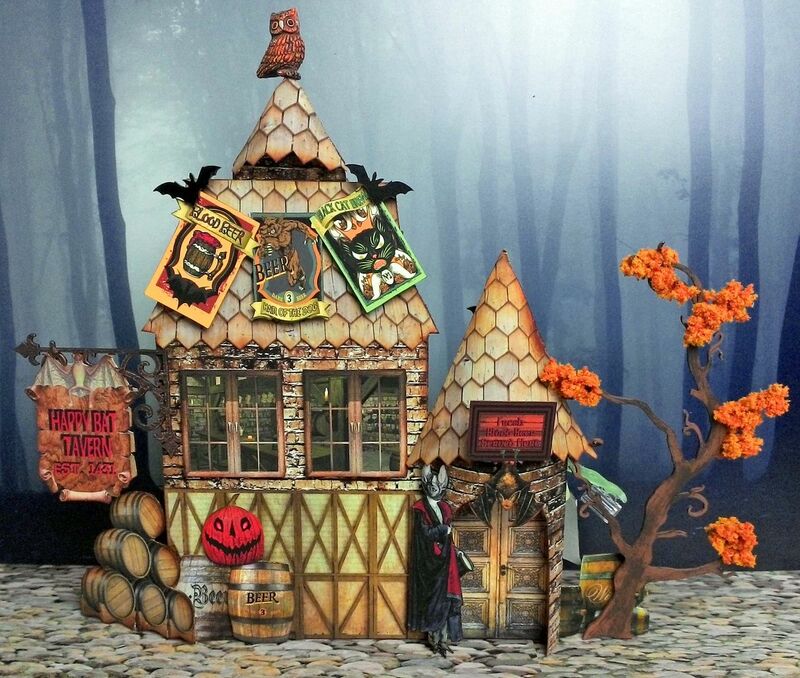 The Haunted House kit contains a chipboard house, chipboard window, 3 collage sheets, and 12 x 12 papers. Click on the image below for more details. 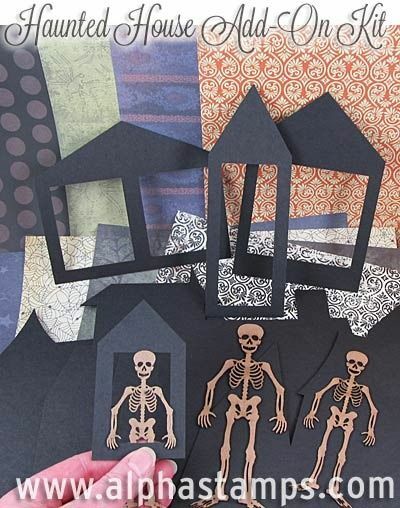 The Haunted House add-on kit contains all four of the chipboard houses, all four of the chipboard windows, 3 chipboard skeletons and 4 sheets of 12 x 12 paper. 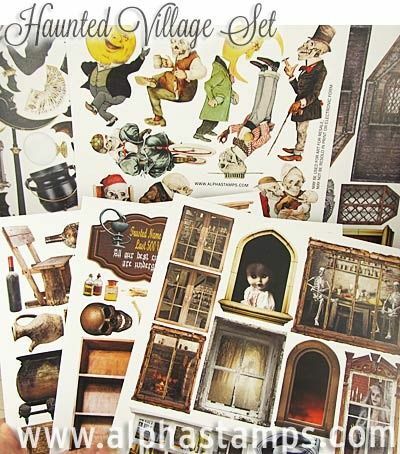 The Haunted Village Collage Sheet Set contains all 11 of the new Haunted Village collage sheets. Click on the image below for more details. There are two videos be sure to watch them both. 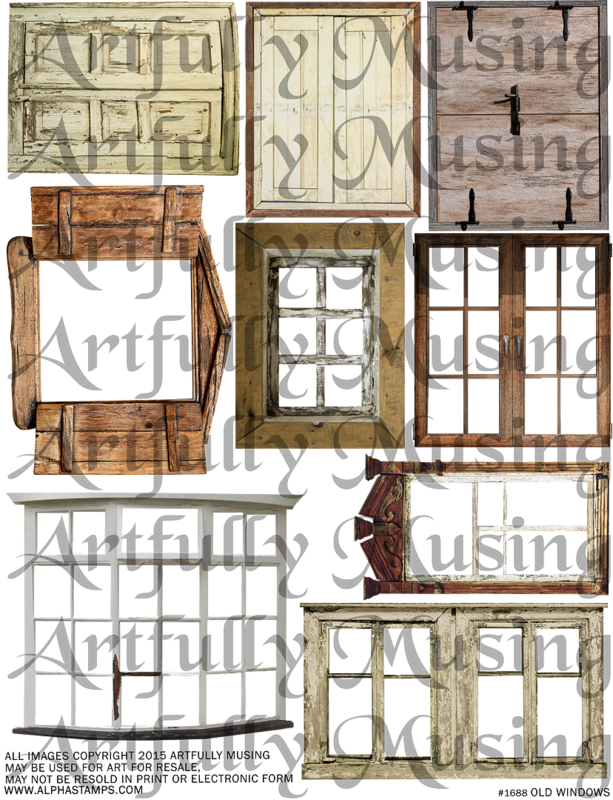 CLICK HERE TO DOWNLOAD A COMPANION PDF DOCUMENT WHICH CONTAINS, DETAILED IMAGES OF THE VILLAGE PIECES AND THE SUPPLY LISTS. 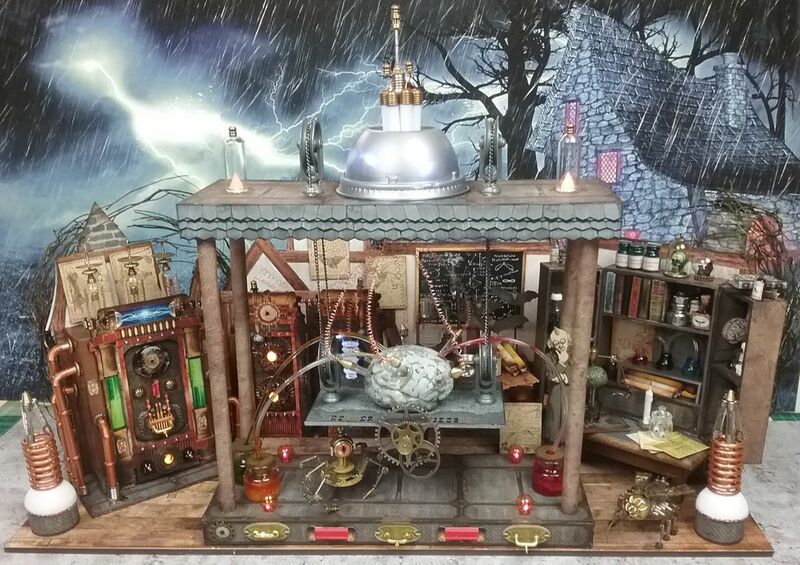 I'VE ALSO INCLUDED A PICTORIAL TUTORIAL OF THE GHOUL AND SONS CHEMISTS SCULL LIGHTS. 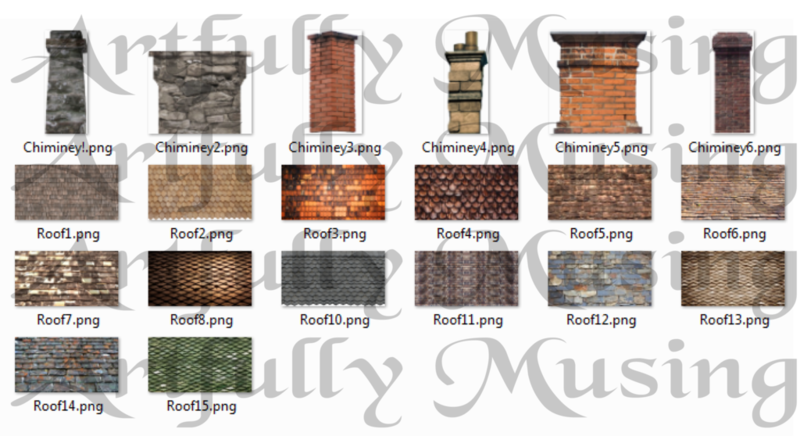 Below is a free collage sheet of wood trims in a PNG format. 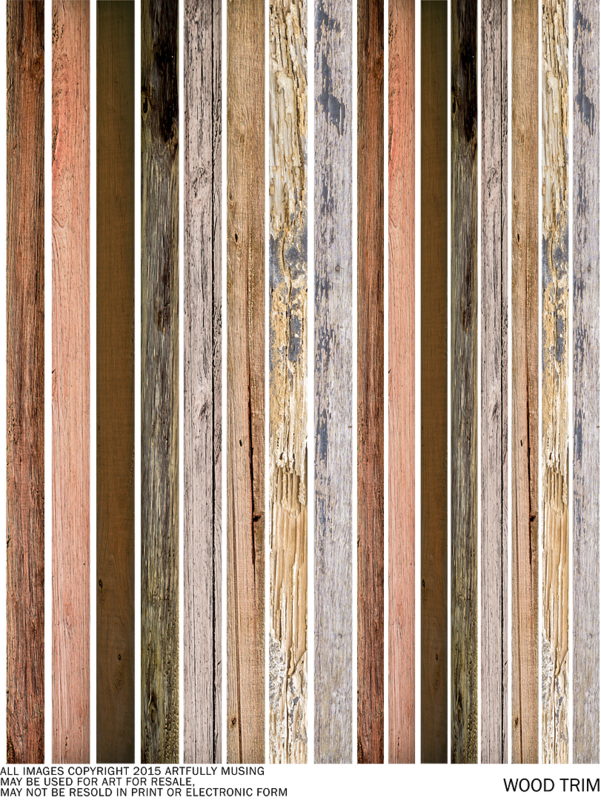 The sheet contains 8 different wood patterns in 2 sizes. 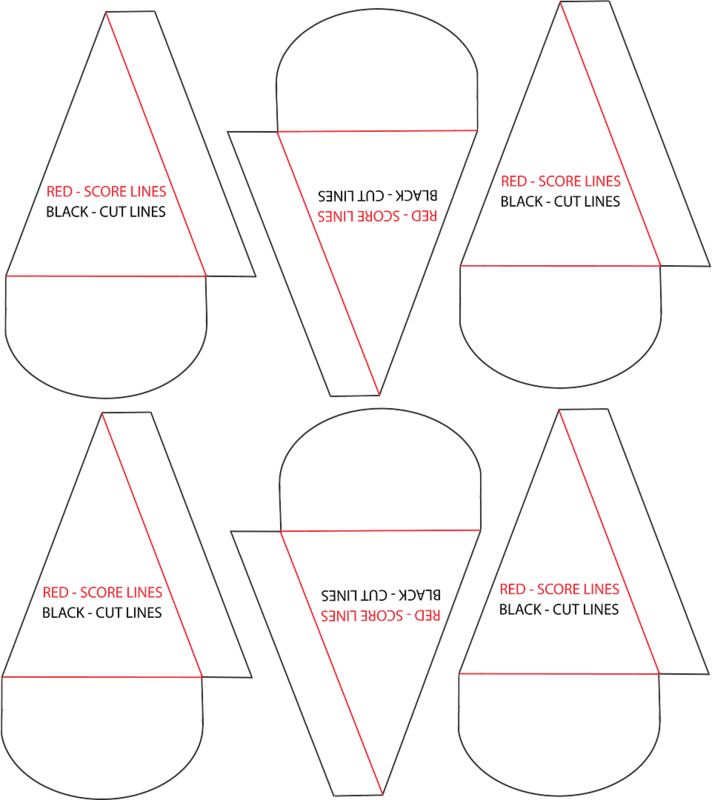 You can use them to trim doors, windows and as baseboards or paneling. 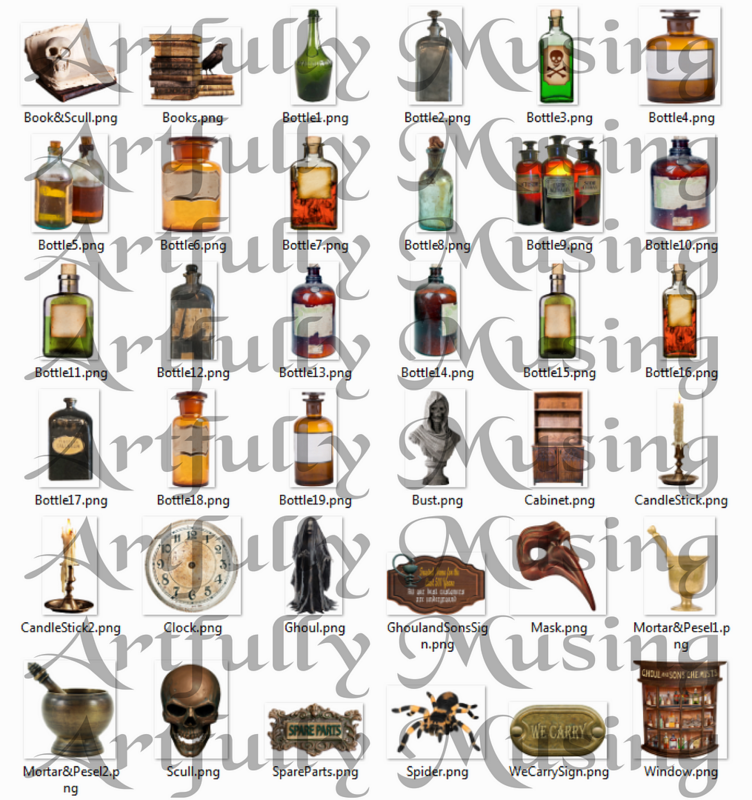 Click here if you would prefer to download an Adobe PDF version of the collage sheet. 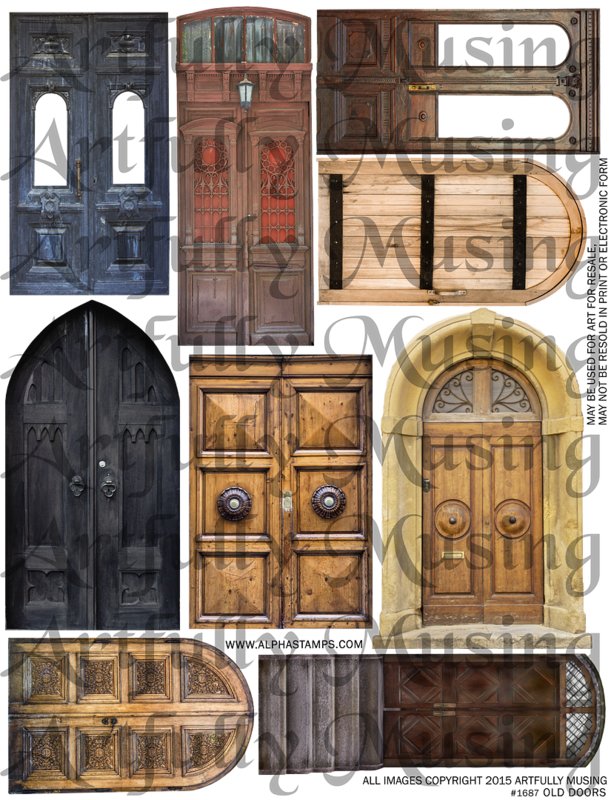 Click here If you would prefer to have a digital image set of the Wood Trim. 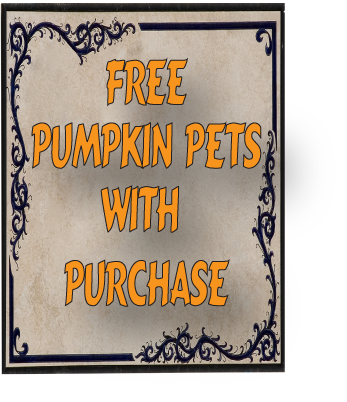 Feel free to use the "Free Pumpkin Pets with Purchase" sign. Below is a sheet of the umbrella template I used for the Retching Toad Eatery. 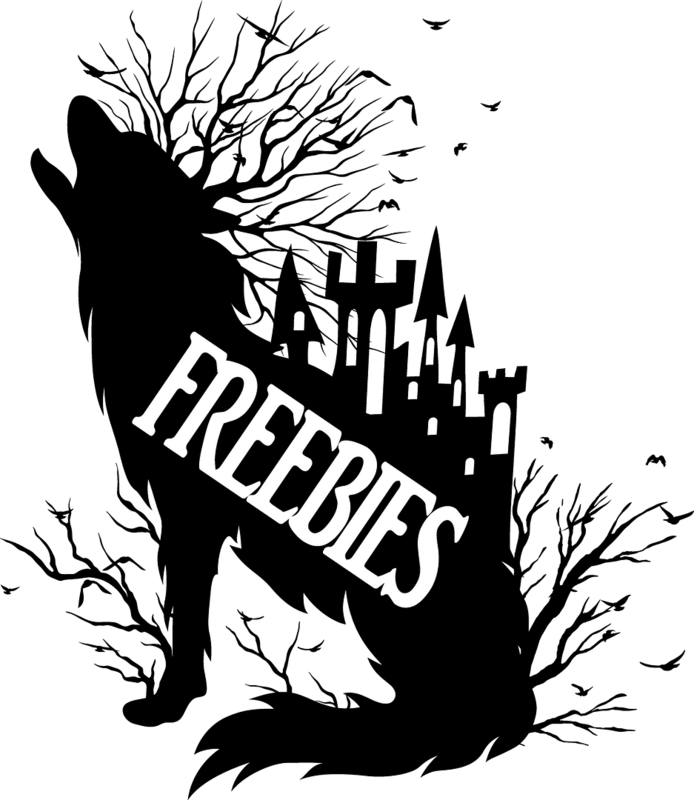 Feel free to download the template. Click on the link below to see the tutorial on how to make paper umbrellas. 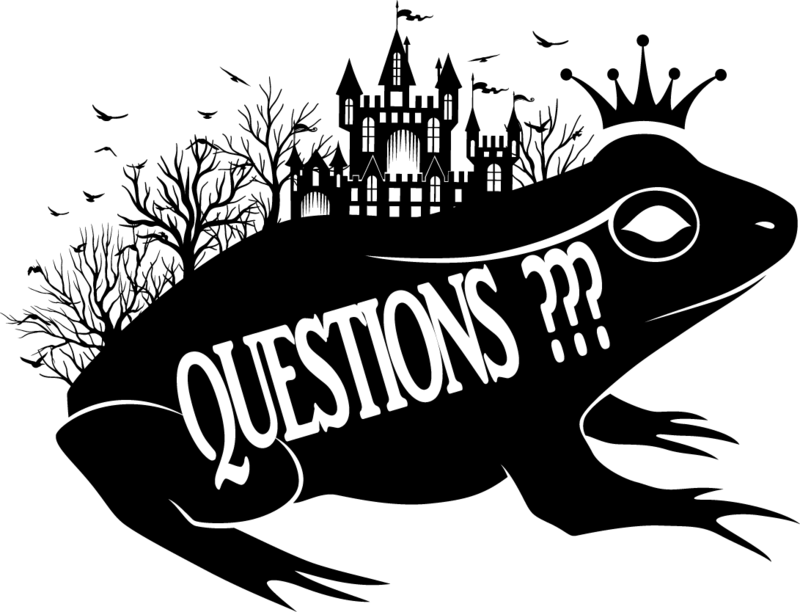 If you have any questions I suggest you use the Email Me button in the left column side of the blog. If you post a question in the comments section, your email address may not be linked to the comment so I have no way to respond to you. If you have asked me a question in the past and have not gotten a response this is why. If the Email Me button doesn’t work for you other options are to send me an email through my Etsy store (https://www.etsy.com/shop/ArtfullyMusing?ref=shop_sugg) or send me a message through my YouTube channel (https://www.youtube.com/user/ArtfullyMusingLaura). 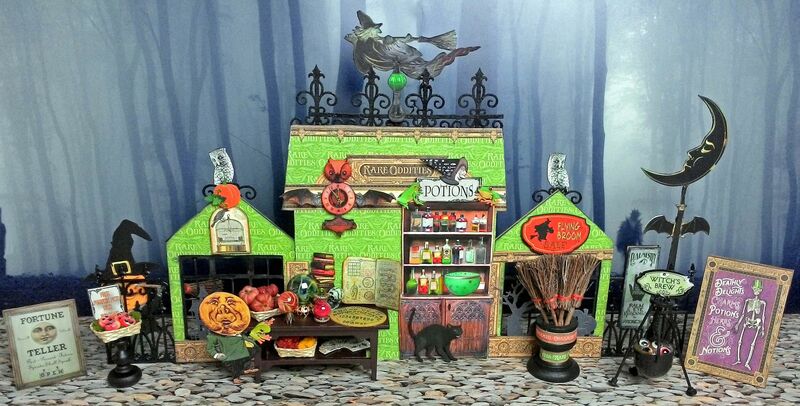 First stop is the Black Cat Emporium where you’ll find unique, strange and sometimes ghoulish items. If you want to stay the night you can always get a room at the Buzzard Bed & Breakfast and should something unfortunate and final occur, Cadaver & Digger Undertakers will take care of everything. Every village has its haunted mansion, a place that is whispered about and strangers are warned not to go near. For Grimsley Village, it's Ghostmore Manor. Some say it's cursed other say it’s full of dark magic. Even the dastardly Cadaver and Diggers Undertakers avoid Ghostmore. It’s a dark and stormy night in Grimsley Village, the kind of night Dr. Deranged has been waiting for. Tonight he will be taking advantage of the lighting storm to further his work on animating a giant brain. With help from his mechanical minions, Dr. Derange hopes to see the culmination of his diabolical plans. Inside all preparations have been made. The brain is resting on the platform being fed by tubes of fluid. The electrodes are in place leading up to the lightning collector installed on the roof. 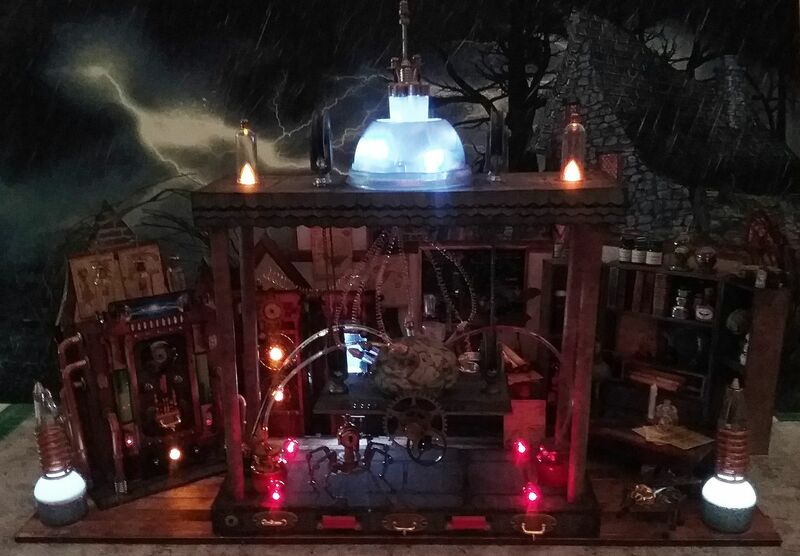 In a fevered frenzy, Dr. Deranged works to finish the construction of his electrical plasma machines which he hopes will harness enough energy to animate the brain. His work is cutting edge and dangerous. If things don't work out, no doubt Cadaver and Digger will be the first on the scene. You can see his formulas on the chalkboard, books, charts and laboratory equipment. It’s taken years of work culminating in this one night. On the outside, the lab appears calm and serene surrounded by seasonal pumpkins and vines, but inside it’s a different story. The storm is getting closer, which means it’s time to fire up the machines. The cemetery gates have been locked for years, no one goes in and no one comes out. Buried behind the gates are some infamous characters like Dracula and the members of the Usher family. Thankfully, Dracula’s coffin is chained and locked. 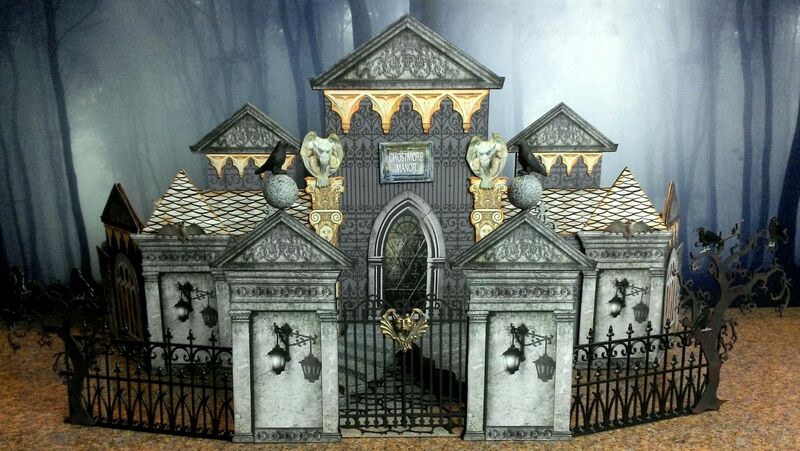 Ghosts float in an out of the tombs, crypts, and mausoleums. It’s rumored that a werewolf stalks the ground. The locals lock themselves in their homes on a full moon. You're really a genius, a source of inspiration! I've no time to make it, but , be sure, I keep everything you make and one day, I WANT to make something like this!!!! Wow, you sure put in a lot of work with it all. Love them sooooo much,need you in UK. Spookilious village! Love the attention to detail! You appear to have a wonderful sense of humour and vivid fantasy life - excellent! I'm totally impressed, that is really fantastic, brilliant and spectacular!!! such love to the detail makes my day,many, many thanks for this ingenious facinating creation! OH Wow, this is totally amazing! What a Work of Art. I hope that i have time to play. I've already posted your badge on my blog with a link back to your site. 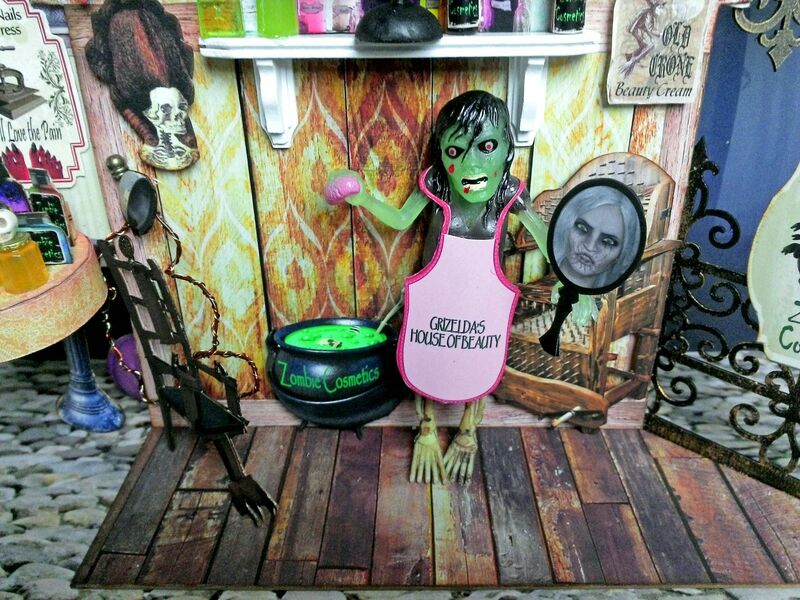 I love Halloween projects and love that i found your site. So much fun and possibilities here. Thanks for a chance to win some of your amazing work. outstanding village. love all the detail. thank so much for sharing. 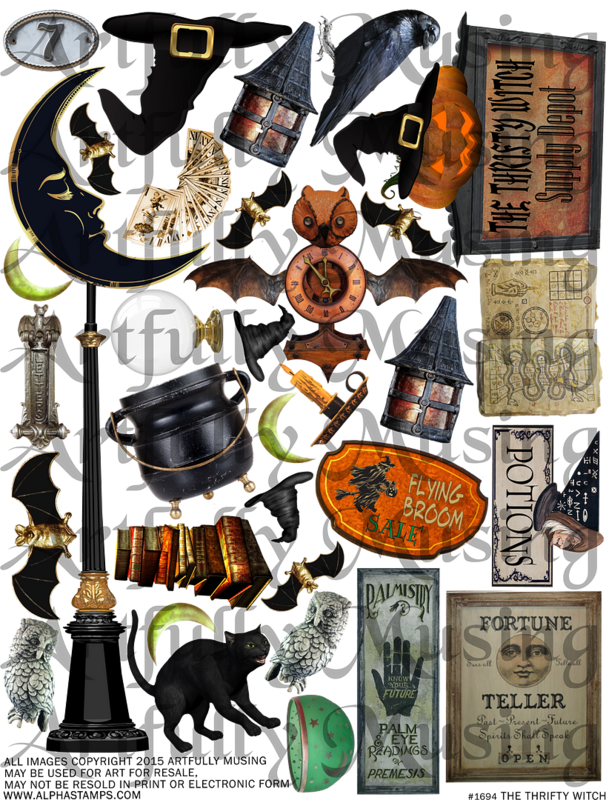 A wonderful celebration for the Halloween Season -- and a cool Halloween badge for our blogs as well! Laura, you work so hard and share so much! Thank you and we LOVE that you LOVE Halloween! Again I am speechless. Your talent is endless. This Village is fantastic and definitely compliments the Halloween Carnival you created before for all of us. I wish I had a Blog to post your Badge on but since I don't, and since I recently started working part-time at a leading Craft Store, mainly to just get out of the house because I have yet to take home a full paycheck, LOL, I plan to let everyone I come in contact with know about your Event. I can't wait to see Part 2 and Part 3. AMAZING, but then again all your work is. This is amazing! I can't imagine how much work you put into creating the haunted village. I have to participate in this, it looks like so much fun :) and I love love love Halloween. Your village is wonderful. 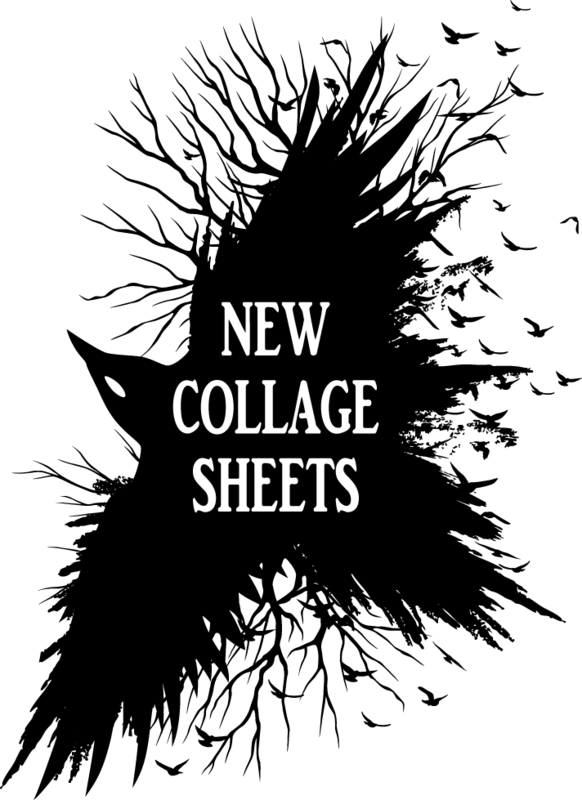 Love all the collage sheets. Laura, your village is so wicked awesome. It's beyond wonderful, and I can't believe that just up the road a few minutes from me, all this spookiness resides. I have no more words, so I think I shall just say Trick or Treat, from your neighbor in Glendale. 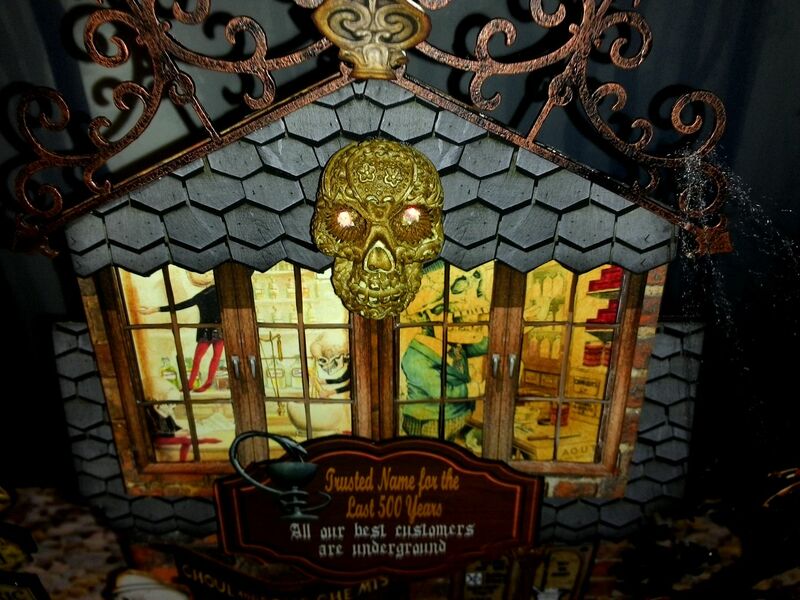 Laura, you have really outdone yourself with the haunted village this year (and even more we haven't seen yet)! I can't wait to get started on it! I have just spent an hour pouring over this post! I am totally beside myself with enjoyment - what incredible cleverness and skill and vision on display! Charming beyond words. Brava Brava Brava! Well you are amazing! I'm absolutely participating in the swap, but I've picked up enough goodies to start working on a village with my husband as well. I've also put the badge up on my blog along with adding a little blog post with a couple of links back to you. Thanks for being so generous! Laura, Wonderful - I am speechless. This is just amazing. I love every aspect of your village and I am going to have to make myself one! Eeek! Aamazing and inspiring as always! I love your Haunted Village, so many wonderful details. Most of all I'm fond of the thrifty witch! Just posted your link on my blog Dark Moon Mysteries. I think people will enjoy your artwork and be inspired by it. 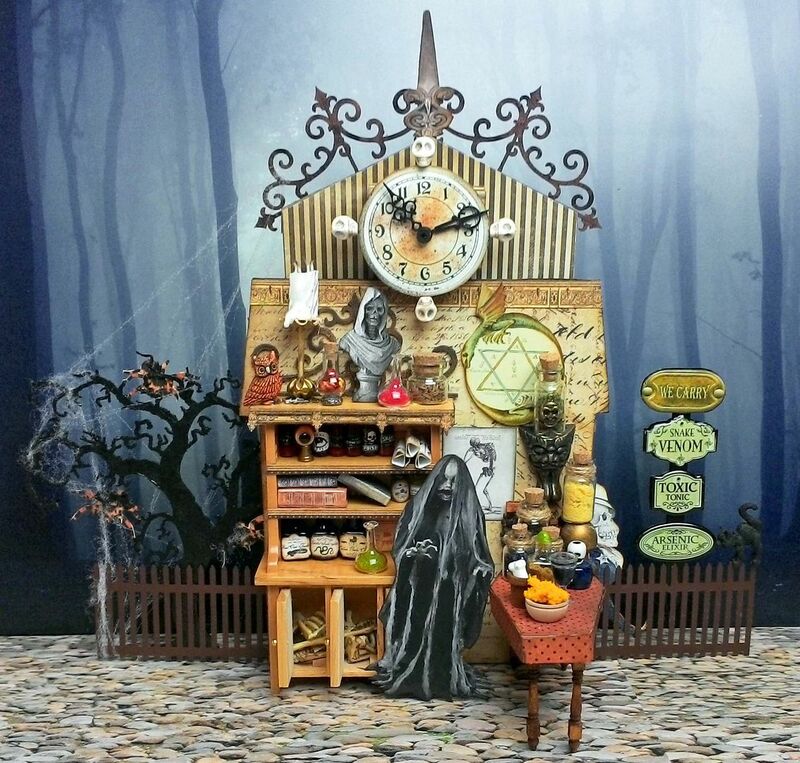 OMG Laura, your Haunted Village is so amazing! I already spread the word at ATCSFORALL.com and on my Facebook Page (Maggie Mannwieler). Your tutorial videos are great! 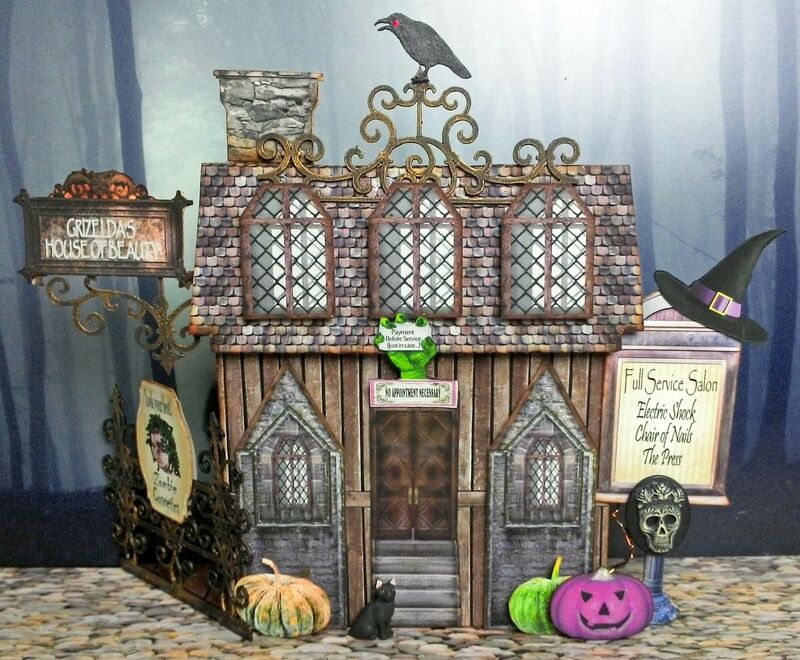 I don't usually "do" Halloween projects but after viewing your tutorials, I just might try something with the chipboard houses:) You are a creative genius and provide so much inspiration - many thanks. Can't wait for #2 and #3!! I'm completely and utterly blown away! What a joy of a post... as the daughter of a dollshouse collector and maker, who gets roped in a lot, I've enjoyed walking the streets of your Haunted Village no end. I'm off to put the badge on my blog sidebar, and really hope to be back to play along. I'm also going to send my mother along for a look! 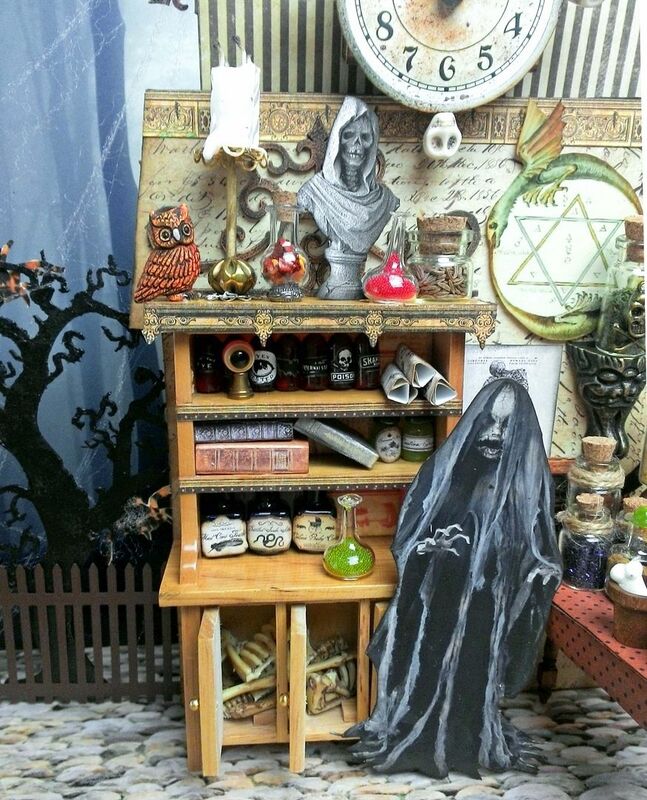 I arrived here after seeing your gorgeous apothecary background being used by Deb Paxton of Valley Folk Art, and I'm so glad I followed her link. 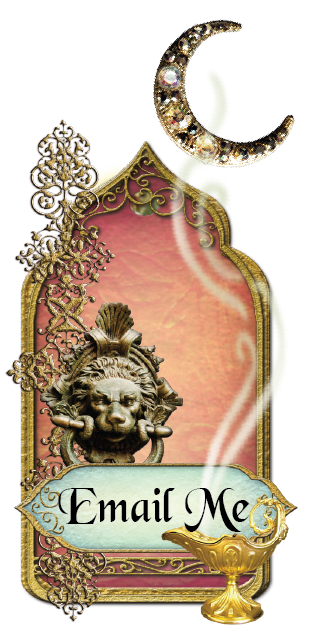 Loved the apothecary and potions event! Looking forward to participating this time! so exciting...glad to see the videos and pics since I wouldn't know where to start! I am absolutely in amazement of your fabulous talent and creativity! 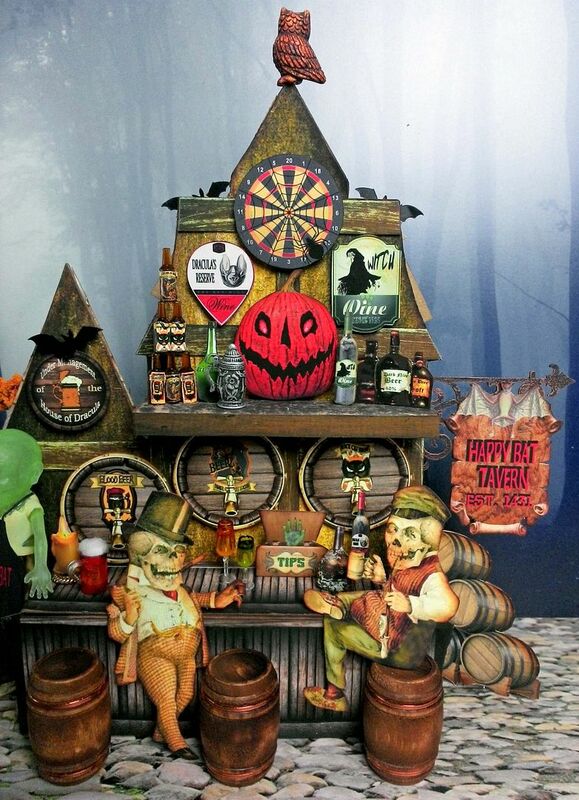 The Halloween Taverns are fantastic and now I find myself needing to create one of those too!! Keep inspiring us with your magical projects! I placed your badge on my blog and added the link! Such a huge and wonderful undertaking, Laura! Lots of fun to stroll around your village and take in all the details. Love the humor and appreciate all the work! This is so awesome!!! I love your stuff, so talented!! Terrific!!! Your attention to detail is great! Love the whole village!!! Hey Laura, I'm just now getting our here to check out your haunted village! Amazing as always. Must have taken forever to create not to mention photographing and writing up the post. So incredibly creepy-cool! I'm sure I'll be making many visits to your village to take in all of the amazing details. I'm totally blown away! You've done it again! Wonderful!! Beautiful! And so much fun! I can't wait to get started! This is amazing, as all your projects are! Sign me up! WOW this is stupendous! I love everything you have to offer for this season. I do so love Halloween and a bit witchy all year round. Thank you so much for these designs! Oh my word, this is awesome. Love all your creations. Keep them coming. 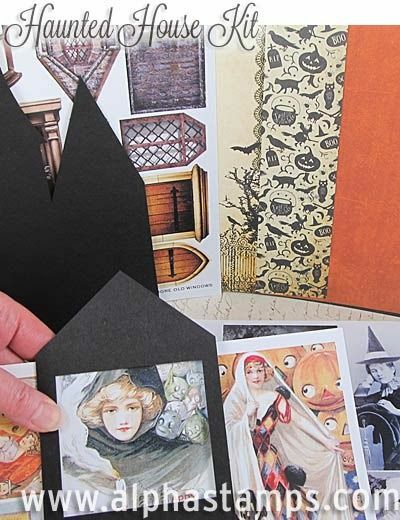 HI Laura, I would love to win the Haunted Village Collage sheets! I love EVERYTHING you do! Wow! What a generous giveaway! I love Everything, especially the 2 skewed on a date! Wow! This is amazing! I just love it all!! 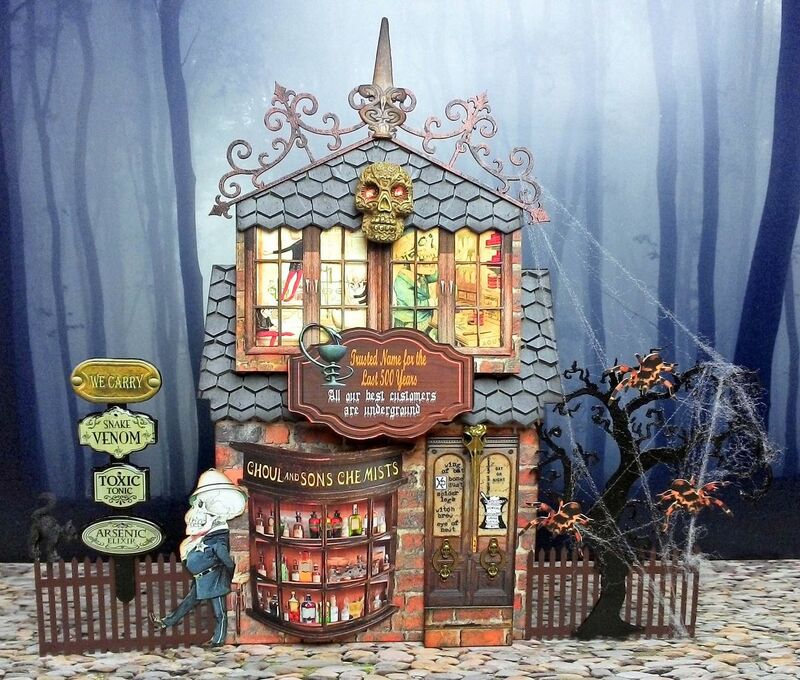 What a fabulously spooky village...love, love, love it! And thank you for the opportunity to win the incredibly detailed collage sheers! You are amazing! I love this spooky village! Thanks for the opportunity to win. So inspired by all the Halloween goodies! 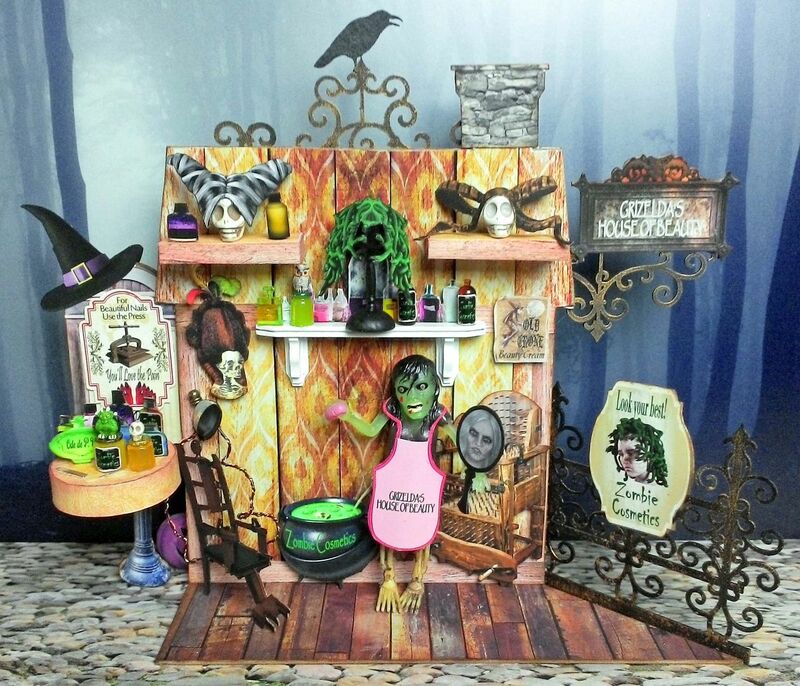 This is so amazing and wonderful..I would love to win this set...I love all Halloween themes...thanks. The entire village is amazing! Thanks for a chance to win the collage sheets! 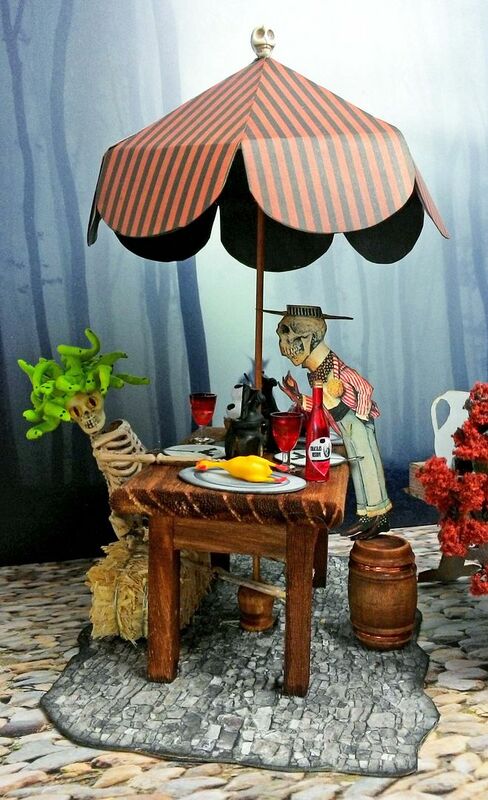 The link has been on my blog since I saw it :) I love, love your creations - the detail amazes me!! Thank you for being so giving with your talent ~ Happiest Halloween!! 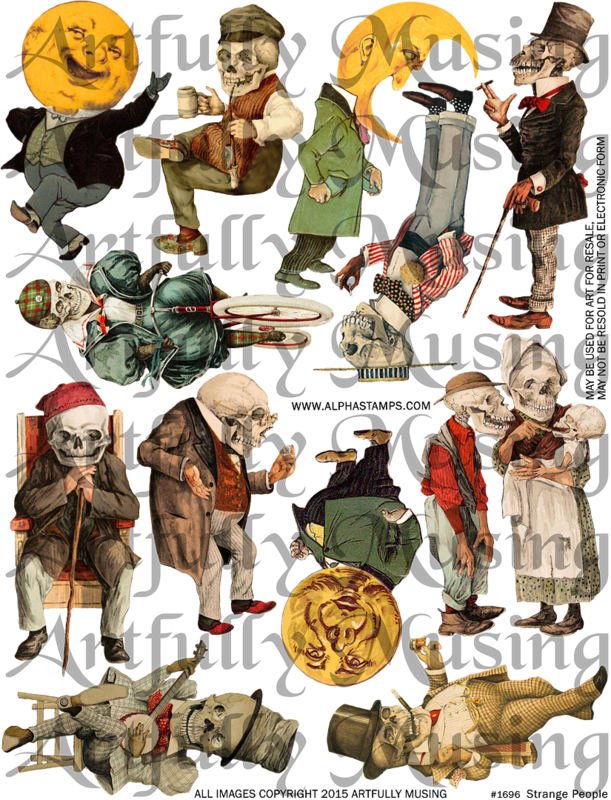 I posted the image a bit ago when you first announced and I did receive a free collage sheet. I just wanted to make sure I also got entered for the drawing! Since I received a house and window as part of the monthly kit I get via subscription, I think I'm going to enter this year. I just have to order the collage sheets. OOh so want to make this!! Oh, I want this the most ever. Halloween is my thing!